Only a few days from the beginning of The Gilded Age Kickstarter, and I can’t help but be worried. Have I done everything I could have done? Will people show up and pledge? Will I make my goal? What happens if I don’t make the goal? Over this last month, I feel like I’ve been living Kickstarter. 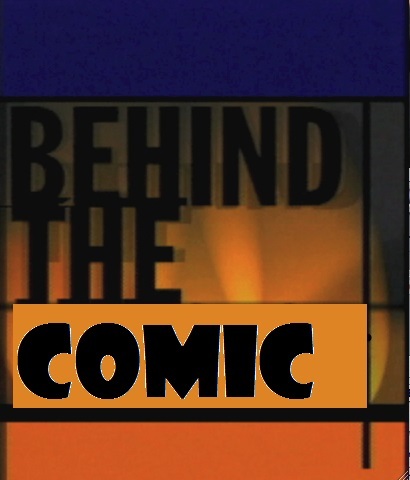 Trying to listen to podcasts or check websites or just view as many comic book Kickstarter pages as I can to glean ideas on how they laid out their pages. Or how they did their reward levels. Or a thousand other pieces. Why did this one project fail while this other succeeded? Is there any reasoning and logic behind what I need to do? For those who might not know, Kickstarter is a crowdfunding platform. It’s a place where creative people seek an amount of funding from a large amount of people to help turn their ideas into reality. Basically, if you have an idea for a product you can take it directly to the public to see if they might want to invest in your idea. If you check out the site you can find anything from coolers to headphones to apps to novels to movies and everything else you might be able to think of. If you have an idea, then maybe you don’t need to go onto Shark Tank and pitch your idea to a bunch of millionaires. No, maybe you go to the people who might use or consume the product. Make sure you launch at midnight! Make sure you DON’T launch on a Wednesday! Always launch on a Wednesday. So you can see why my head might be spinning. With the campaign I’m launching on Tuesday, October 17, 2017, I’m doing something that feels like it has been YEARS in the making. I’m actually afraid to look and see when the very first “Gilded Age” email shows up in my gmail (April 2009 is the answer). That’s when my very first conversations began when I first saw that Steampunk Cowboy image from artist Larry Watts. Independent comics are a lot like herding cats who are being chased by dogs who are being examined by aliens who are from a long-lost civilization no one’s ever heard of before. By that, I mean there are different personalities to interact with. I’ve long said the best thing about comics is the collaborative aspect of the medium. As a writer, you need each and every one of the people to put in a piece of themselves or it just won’t work. It means sometimes waiting for people. It means sometimes people waiting on you. And it means producing the comics and then selling them. The problem is that our model was to do digital versions of the comics but have a short print runs for conventions. And sometimes that meant we’d sell out of a particular issue waiting to reorder the books. Kickstarter is a potential answer for those problems. Since The Gilded Age is done, this is about covering the printing costs. Really it’s like your preordering the graphic novel… with some potential bonuses. Funding this is about everyone who had a hand in the creation of this comic. Too many times have I seen projects get started only to die before anyone ever gets to see them. I want to continue this journey and tell more stories and collaborate with these creators who have impacted the better portion of a decade of my life. Hopefully, you can help me do just that! 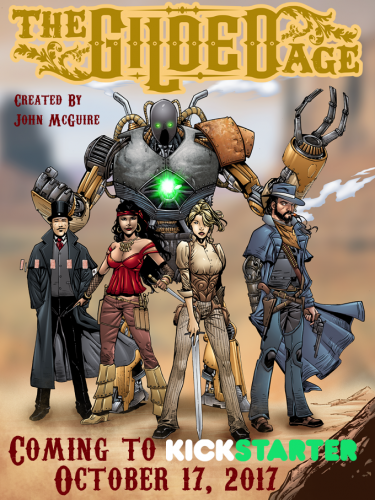 Tagged John McGuire, Kickstarter, Steampunk, Steampunk Fridays, The Gilded Age. For me the $5-$10 print and digital level is the sweet spot. That is the easiest level to justify coming back for subsequent issues. $10 or more per issue for 4-6 issues, no way. Solid rewards for stretch goals is a good idea as well. I prefer spamming Twitter if you are going to not my email. Solid info updates is a must as many campaigns hit road bumps somewhere along the way. I say all this having supported 40-50 Kickstarters. Good luck. I’ll look you up. Your numbers are about in line with my own preferences on Kickstarter comics. This one will be $25 for the printed Graphic Novel (contains 4 issues). Do you feel like you need to see the Stretch Goals immediately (say on launch)? In my research I’ve seen it both ways where people list them and some where they do not. I was thinking, if (hopefully) I start getting close to my goal, then I would do an Update to announce the first 2 Stretch Goals. 25 for a 4 issue trade works. Stretch goals not right away but definitely have them planned out and show them at some point even if they aren’t reached.